This 9,000-square-foot Hamptons home is a full-fledged resort offering a version of paradise for warm weather outdoor enthusiasts. The four-acre, ocean-front property not only comes with 113 feet of private beach rights, but it also includes a saltwater pool, bocce court, a gourmet outdoor kitchen, a fire pit and outdoor fireplace, and multiple decks and patios for both entertaining and private retreats. Built in 2007, the sprawling eight-bedroom residence just hit the market for $14,500,000—the highest priced residence ever to go on sale in East Quogue. 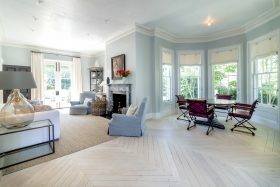 In addition to his Murray Hill townhouse, President Chester A. Arthur also owned this three-story Victorian mansion built in 1796, which he considered his “Summer White House.” The luxurious fully renovated Hamptons property was last on the market in 2016 for $14.2 million, or $480,000 annually for potential renters. Just in time for Presidents Day, the six-bedroom, four-and-a-half bathroom home is back for a reduced $13.5 million. As 6sqft previously noted, the cost to rent this presidential pad between Memorial and Labor Day was estimated to be $390,000. 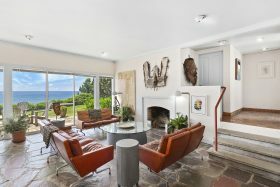 Fashion designer Ralph Lauren is in contract to buy playwright Edward Albee’s former estate in Montauk, the Wall Street Journal reported on Thursday. The property had last been listed for $20 million, the first time on the market in 50 years, but the final sale price has not been confirmed. Located on 2.8 acres with 200 feet of Atlantic Ocean frontage, the four-bedroom home was first purchased in the 1960s by the “Who’s Afraid of Virginia Wolf” writer, who died in 2016. 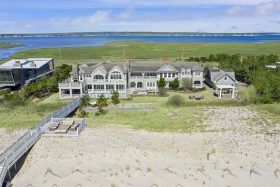 With this purchase, Lauren, who owns homes on either side of the property at 320 Old Montauk Highway, adds to his continuous strip of oceanfront real estate. This five-acre waterfront family getaway on the Hamptons’ Peconic Bay was designed by Manhattan-based firm Mapos with the intention of being sustainable and timeless (h/t Dezeen). The site’s existing tree arrangement was maintained at the request of the family, who were particularly taken by an old Sycamore. So as to not disturb the existing fauna on the property, it was also decided that only unfinished materials would be used in the home, including steel and concrete – painted sheetrock was strictly out – and allowed to naturally patina. Image of Luann De Lesseps: Wikimedia Commons. Just six months ago, “Real Housewives of New York City” star and Skinny Girl maven Bethenny Frankel bought her second home in the Hamptons, a huge and historic Bridgehampton spread at 2623 Montauk Highway. 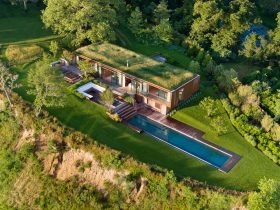 The 4,200-square-foot home, a former bed-and-breakfast known as the Morning Glory House, cost her $2,037,000, but she merely made the purchase as an investment, keeping her Bridgehampton residence as her main home. And now she’s looking to cash in, as Curbed Hamptons reports that Frankel has re-listed the property for $2,995,000. Property in Montauk–where billionaires live in trailer parks–just isn’t like other places. For example, this windmill house was built in 1928 by Arthur W. B. Wood, an architect who was enamored of–you guessed it–windmills. 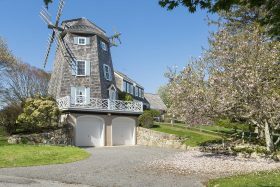 Though the windmill that’s part of the six-bedroom home at 162 Fairview Avenue isn’t a real, functional windmill, it is the only windmill house in Montauk. And it’s currently on the market for $1.9 million. Haven’t planned a summer vacation yet and have $55,000 floating around? 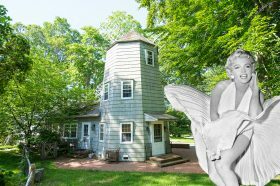 Then consider renting this East Hampton windmill home, a unique abode once leased in 1957 by Marilyn Monroe and Arthur Miller. The charming two-bedroom, one-bathroom house measures 1,100 square feet across three floors. The windmill home, located in the historic Amagansett neighborhood, is currently only available for the entire summer, from Memorial Day to Labor Day, and year-round for $68,000 (h/t Curbed Hamptons). 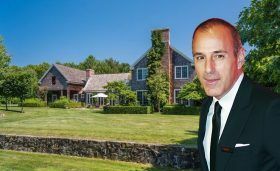 Former NBC anchor Matt Lauer seems to be having trouble selling his “spare” Sag Harbor house–one of three Hamptons homes he owns with his likely soon-to-be ex-wife Annette Roque–which the disgraced ex-“Today Show” co-host is currently listing at $12.75 million, according to the Observer. Lauer first listed the 25-acre estate at 2301 Deerfield Road for $18 million in July of 2016. The asking price was shaved by $1 million that September, and then again in June 2017 to $14.9 million. The 8,000-square-foot, six-bedroom shingle-style house comes with a huge gunite pool and pool house, tennis court and gorgeous landscaped grounds and was designed by architect Daniel Romualdez with interiors by Muriel Brandolini; but the answer still seems to be no, thanks. Would you want to give this guy 12.75 million?